Whatever the reason, people are always looking for a bargain, and razors are no exception. The idea is to find things that are affordable but don’t skimp on quality. This article will provide in depth reviews of the best cheap safety razors on the market. Whether you are a new wet shaver seeking to purchase your fist DE Razor or if you are an experienced hobbyist, price and budget matter. There are tons of low cost razors out there, so you want to make sure that you get a high quality product, but at a price that you like. In addition, there are a lot of re-branded razors in the online market. An example of this would be a company in China manufacturing thousands and thousands of razor design. Different companies will buy this razor and market it as their own by etching their name on it. So you can buy the razor for around $10 dollars retail or you can buy it for triple the price with a company’s logo on it. The safety razors that are mentioned below do not fall into that category. The Merkur 34C Heavy Duty was the first safety razor that I purchased. I still use it today, even over more expensive razors. It has a solid reputation as you can see from the amazon reviews . The simple and rugged design of the Merkur 34C serves it’s purpose well. Made in Germany with world famous Solingen steel, this razor should last you a lifetime. Thousands and thousands of men have learned to shave with this razor over the last one hundred years. The handle is short with a non-slip knurled grip, and it is a two piece razor. If you are not used to using a DE razor, this is a good thing because slippery soap on a handle can cause problems for your face. It does come with one razor. 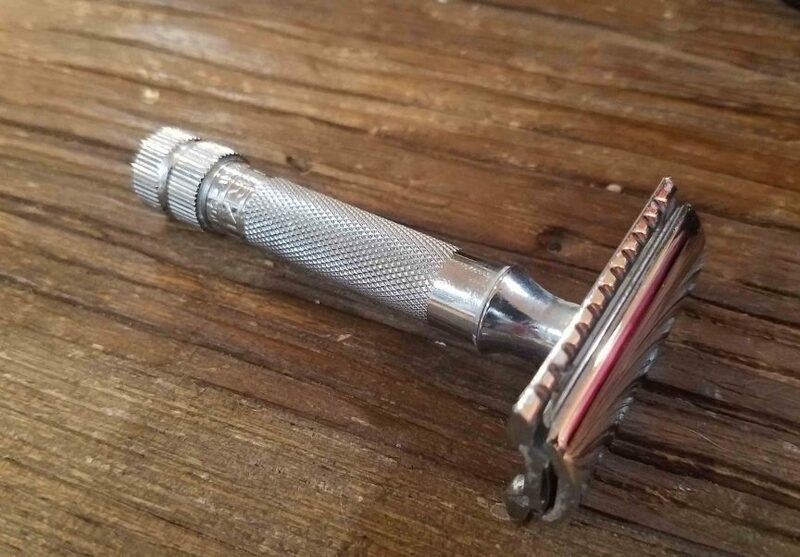 This is a fantastic razor, and it has been proven to be so over 100 years. You really cannot go wrong with owning one of these. Aesthetically, it is the polar opposite of the Merkur 34C. While the Merkur is more rugged looking, the EJ safety razor is sleek, polished, and elegant looking. It has a mirror like polish, and it looks like an expensive razor. The down side of the polished look is the somewhat slippery handle if you get soap on it. This may not be an issue if you are an experienced wet shaver, but if you are new, take that into consideration. Like the Merkur, this makes a great first razor as well. It is well balanced and provides a smooth shave that is not too aggressive. The WCS Midnight Collection Razor 84B, Black Stainless Steel is a solid performer all around. It is made with 303 Stainless Steel, and if you are concerned with your razor slipping, this is the product for you. The handle features curves and is knurled. The head is made out of zinc alloy that is chrome plated. It has a very economical price point, and if cost is your main driving factor, then this is a solid choice for you. This is a not an aggressive razor, and the only thing I do not like about it compared to the Merkur is unscrewing the head off to put in a new blade. It has a nice black matte coating on it, so it has a different look than most razors that are polished chrome. There are not a lot of reviews on this razor at amazon, but I know a lot of people that have it, and they are very satisfied with it. It is machined well, and a solid razor. When I first got it, I used it all the time, and I was very satisfied with it. I don’t use it as much anymore, but that has nothing to do with performance or issues with it. This is the same as the above razor, only in Stainless Steel instead of black. This beautiful nickel plated razor is an homage to the classic Kirby Beard Company Razor of England. This is a classic 3 piece design with an eye catching scalloped top cap. It has a slim head design which will help you get into those hard to reach places while shaving. This is designed very well, and it is a stunning looking razor. It is a little more aggressive than the other razors listed here, and it is a solid addition for anyone that is trying to grow their razor collection. So many people start out with a Merkur or Edwin Jagger, and if you are looking to move into something else, the Prismatic is a great choice. The price point of $25 is a very fair price for this. There are a lot of reviews on YouTube, so if you are really considering this razor, and you like to learn about wet shaving products, you should be able to get a lot more information on YouTube. If you are looking for the best cheap safety razors, we have provided 4 high quality inexpensive DE razors. They are all slightly different, so you should be able to find one that fits your style. The Merkur is rugged with a short handle, the Edwin Jagger is polished and elegant, the West Coast Shaving razor has an entirely different look with its black matte finish, and the Phoenix Prismatic has a completely different look with the scalloped head design. As we mentioned in the opening, be careful of buying re-branded Chinese razors. Look, there is nothing really wrong with them, but we just want you to be aware of how things are done. If you like the packaging that some of them come in, and if you like the brand name etched in it, and you don’t mind paying triple price, then go for it. But, in our opinion, you can get one of the excellent razors listed here with years of history for the same cost or slightly more. This article was designed to provide some options for the best cheap razors out there, and we hope that you find it helpful. I am one of those people that prefer low cost razors so that I can spend all of my cash on Martin de Candre so I know what it is like to be in the market for one of these. Please provide any comments below if you decided to purchase on of these, or if you already have one.